Clean Carfax. Soft-Top included. 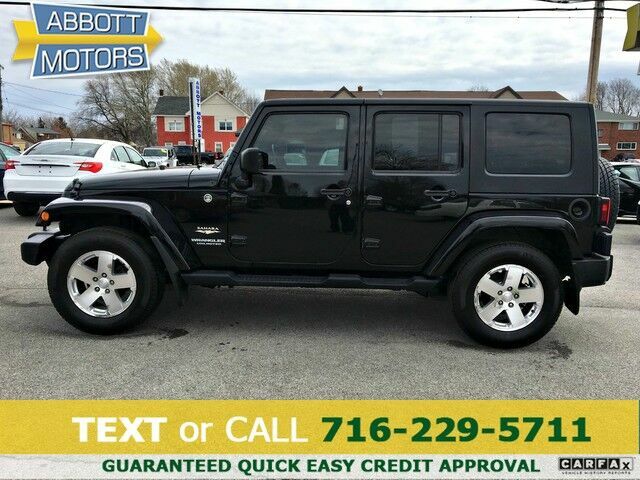 ABBOTT MOTORS, An exceptional car buying Experience, is offering this exceptional Black 2009 Jeep Wrangler 4Dr Unlimited Sahara 4WD w/Hardtop & Soft-top for sale. CALL or TEXT (716) 229-5711 for quick answers to your questions about this vehicle. Your message will be answered by a real human never an automation. We stock only the highest quality vehicles which have undergone a full safety inspection, fresh oil change, professional detail and Carfax Guarantee. All vehicles come with a Written Warranty and Extended Warranties are also available. This Jeep includes: DUAL TOP GROUP Targa Roof Convertible Soft Top Convertible Hardtop When you purchase a vehicle with the CARFAX Buyback Guarantee, you're getting what you paid for. On almost any road condition, this Jeep Wrangler 4Dr Unlimited Sahara 4WD Hardtop offers solid performance, reliability, and comfort. Simply put, this Four Wheel Drive is engineered with higher standards. Enjoy improved steering, superior acceleration, and increased stability and safety while driving this 4WD Jeep Wrangler 4Dr Unlimited Sahara 4WD Hardtop. The Wrangler 4Dr Unlimited Sahara 4WD Hardtop has been lightly driven and there is little to no wear and tear on this vehicle. The care taken on this gently used vehicle is reflective of the 94,098mi put on this Jeep. Rare is the vehicle that has been driven so gently and maintained so meticulously as this pre-owned beauty. This impeccably built Jeep Wrangler 4Dr Unlimited Sahara 4WD Hardtop comes with a plethora of added features that have made this vehicle a unique find. These options will simply amplify the experience of owning and driving this wonderfully crafted Jeep. Enjoy the drive without worrying about directions thanks to the built-in navigation system. High-performance tires are another option found on this vehicle. Buying a pre-owned vehicle shouldn't mean buying a vehicle with scratches, blemishes, and paint touch-ups. Fortunately, the paint on this 2009 Jeep Wrangler 4Dr Unlimited Sahara 4WD Hardtop is as flawless as a new vehicle. This is your chance to own the very rare Jeep Wrangler 4Dr Unlimited. This Jeep is equipped with some of the most amazing wheels the market has to offer! Once you take this Jeep Wrangler 4Dr Unlimited Sahara 4WD Hardtop for a test drive, you'll immediately realize how much of an added bonus this vehicle's upgraded wheels will provide. More information about the 2009 Jeep Wrangler 4Dr Unlimited: The rugged Jeep Wrangler maintains a strong cult following of off-road purists. It's a great choice for those who have an active, outdoor lifestyle that involves frequent off-roading and tough terrain. With its last full redesign in 2007, the Wrangler picked up modern safety features and a more refined driving experience without losing its distinct character. And the new Unlimited model has a back seat big enough to fit adults. What's more, Jeep claims that the Wrangler is the only true 4x4 convertible, which sets it apart from anything else in its class. This model sets itself apart with Tough off-road ability and rugged style ABBOTT MOTORS has over 50 years of automotive experience! We are also a CARFAX Advantage Dealer specializing in outstanding customer service and satisfaction! We offer FINANCING FOR EVERYONE...ALL CREDIT APPS ACCEPTED. We look forward to helping you purchase your next vehicle. Apply Online 24/7 at Abbottmotors.com ... All Trade-ins Welcome... Same Day Delivery... Call or Text Today and See The Difference... We Look Forward to Serving You!! This vehicle may be subject to potential open recall(s). Vehicle recall information may be found at Safecar.gov. Please verify price, equipment, options and features with your sales rep before your purchase. We Look Forward to Serving You. *Tax, title, plates extra. All Financing On Approved Credit. We are a BBB accredited member.